After an average of 36 hours traveling and a few more hours of acclimating, we are in the throes of the School of Rock! So who are “we” and what are we doing? We are 16 formal and informal educators from the United States, Europe and Africa. We are science teachers and technology teachers. We teach elementary and secondary students, college students, and the general public. We hail from California, Florida, Tennessee, New Jersey, Texas, Illinois, North Carolina, Maryland, and Ohio, as well as France, Italy and South Africa. We are novice and veteran educators; collectively we have over 215 years of experience in education. We are exploring the relationship between ocean cores and climate. In one day, we’ve learned about IODP’s history, we’ve been trained in lab and ship safety, and we know that 202-1236A-2H-1W identifies the first part of the eighth section of the second working core from the first hole drilled at location 1236 on expedition 202. Our fearless leaders are Sharon Cooper with the IODP, Dr. Larry Krissek from Ohio State University, and Dr. Sandy Turner from University of California Riverside. Modeling good pedagogy, Drs. 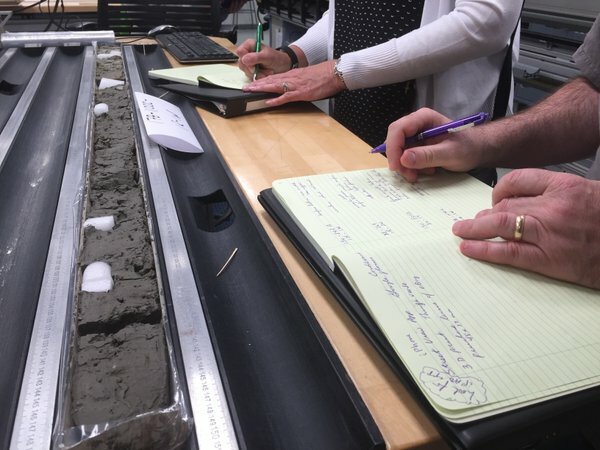 Krissek and Turner began the day by giving us time to observe and generate our own questions about cores from throughout the ocean – some over 40 years old. What similarities and differences do you notice in these cores? Color was likely an obvious difference you noted. Is there a relationship between color and the composition of the core? How do scientists investigate this question? With smear slides and a petrographic microscope, of course! 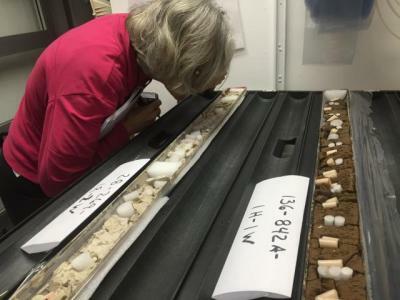 A small amount of core sediment is analyzed for the presence of biogenic material. Cores lighter in color (white, off-white, light beige or greenish yellow) likely have a biogenic origin. If over 50% of the sample is composed of biological remnants, then the core is an ooze; the presence of diatoms is a key indicator the ooze is siliceous while coccoliths and forams are indicative of calcareous ooze. Darker cores (perhaps greenish gray or reddish brown) will likely have considerably less biogenic material. But it’s not just about core color . . . geographic location and ocean depth also provide insight on the composition of the core; plotting data points on a world map revealed exciting patterns! Terrigenous sediment (terrestrial in origin with relatively less biogenic material) is found relatively near the coasts. So how did that sediment get there? Erosion by water (rivers, streams, runoff, glaciers) deposits relatively large amounts of sediment on continental shelves and slopes. Eolian or wind erosion can carry small particles further distances from coastlines. Calcereous ooze is typical of sediment in offshore, yet shallow (<4000 meters) water. And being in offshore sediment in both high latitudes and near the equator, we would say siliceous ooze has a bimodal distribution. But what about the sediments in the deepest waters? Terrigenous material is unlikely considering the far distances from the coast, and organisms in the oozes would not be viable in sediment under more than 4000 meters of water. So that leaves the fine clay particles and pieces of iron oxide that result in the red clay in cores drilled in the deepest parts of the ocean. Thus, by the end of the day we had established a baseline set of knowledge around the types, distribution, and origins of ocean sediments. We have to understand the present in order to explore the past . . . and discover the connection between ocean cores and climate! The geology rocks, but what about the pedagogy? How might we bring all this cool knowledge to our learners? The evening brought time to begin exploring the education resources on the JR’s website and brainstorm ideas for developing our own lessons and activities. Tomorrow’s hikes to five different sites of geological significance in Cape Town should give us more time to network and share ideas.